27 year old Philippa Russell from High Halden, Kent is just one of those to have benefited. 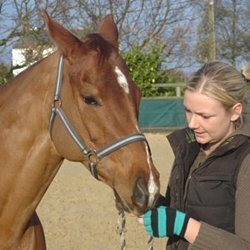 The Fund was there to provide advice when she experienced a bleed on the brain, following a fall whilst practising polocrosse out in the paddock. “To this day, we don’t know why or how she fell. The going was a bit slippery and the horse returned to the yard with mud on it’s saddle. It all happened so quickly. I had a friend at the time who had incurred a head injury from riding and whom the Mark Davies Injured Riders Fund had helped and she put us in touch with the charity,” explains Philippa’s mother, Sally. The accident left her very weak down her right side and some double vision. That was in August 2006 and three years on, Philippa has recovered enough to take on a new challenge and start to get back into work. So, the Fund has stepped in to help Philippa retrain as a nursery nurse. For about 8 hours a week, she attends a nursery in Benenden to qualify for an NVQ Level 2 in Childrens’ Care, Learning and Development. Sadly, the family doesn’t have horses any more but Philippa is enjoying her new interest: “I work with the under twos and really enjoy watching them develop and learn new things. Without the help and encouragement of The Mark Davies Injured Riders Fund, I wouldn’t have been able to do this so I can’t thank them enough for being there. “I don’t remember anything about the accident but I do know that we would have been lost without their help,” ends Philippa.